UIG will assist you in designing quality water, wastewater treatment or sewage treatment facilities for your specific needs, utilizing our bolted steel tanks, welded steel tanks and/or fiberglass storage tanks. In all cases, UIG has the expertise to assist your selection of waste treating options. We will consult with your team to choose the optimum economic system for your needs. Not all waste water is the same. It may be that the waste water from your industrial application is relatively clean, but not quite appropriate for discharge into the environment. Or you may be dealing with a high level of contamination, as may be the case with civic sewage systems. Relatively strict environmental laws control the levels of contamination in the effluent from most industrial and civic sources. These laws ensure safe treatment and disposal of waste waters worldwide. There are many different types of waste water treatment processes. Each process is intended to produce water that can be recycled to industrial applications or disposed of safely. Prior to selecting and designing the treatment operations, it will likely be necessary to obtain a proper laboratory analysis to identify the character and amounts of each significant contaminant. Once those are known, UIG may assist you to select the best and most economical treatment system. UIG will plan, design, fabricate and construct your complete waste water treatment facility. Your answers about these parameters will help determine the type of sewage treatment plant you will need. 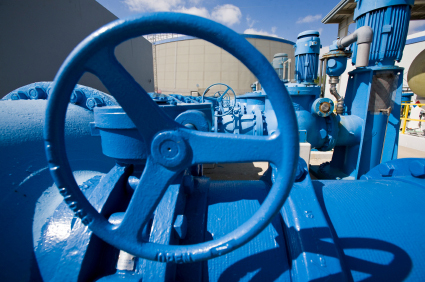 There are several means of treating water for public and industrial use. Among those are Reverse Osmosis (R/O), Ultraviolet (UV) exposure and others. UIG will design and supply the right water treatment system for your needs, ensuring that the resulting water is clean, pure and ready for immediate use in your applications. Reverse Osmosis (R/O) is often the preferred method of choice for the desalination of brines and sea water. The R/O process involves passing water at pressure past and partially through a specially designed membrane that removes salt and other contaminants. R/O operations can be rather expensive for normal seawater desalination applications, however, the same technology may be applied more economically to the removal of lesser impurities from water from other sources. Even regular sources of tap water may contain contaminants (including lead, arsenic, mercury, diluted pesticides and others) that must be removed. Water from rivers and lakes may contain these impurities, bacteria and other foreign matter that must be removed before the water is safe to drink. 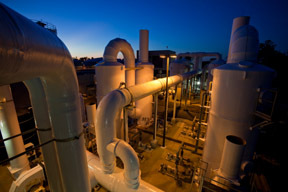 Membranes similar to those used in R/O desalination are used at somewhat relaxed operating conditions to offer economical operations for potable water and specialized water treatment uses. When you have identified your source water, it will be necessary to obtain a water analysis, identifying the impurities and their concentrations. From that data, a suitable water treating system may be identified and a decision whether or not R/O is the best solution for your needs. Depending on the degree and types of contamination present, the recommended process may simply require multimedia filters with or without the use of and R/O system. Multimedia filters are designed to remove specific impurities by a series of interconnected filters. These filters may also remove odors and tastes cause by dissolved and suspended impurities in the water. Many of these units may be skid-mounted and equipped with the pumps, valves and controls to make them immediately operational.If R/O clean-up is determined to be necessary, it would be installed after the filter system. UV (Ultraviolet) light systems use high energy ultraviolet light to kill bacteria and other organism that may be present in water. A major advantage of UV systems is that NO chemicals are needed to kill such microbes. UV systems usually very cost effective and simple to install. It should be noted that UV will not remove dissolved chemicals such as arsenic, lead, etc., nor will it eliminate suspended solids. UIG designs, fabricates and installs all types of water treatment plants to suit your requirements. 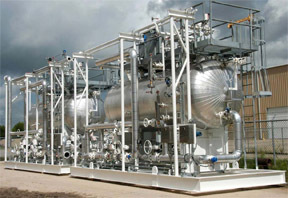 Depending on the capability, the plants may be packaged units, single or multiple tanks or a combination designed for your specific needs and available construction area. Let us help you design your next project from start to finish.